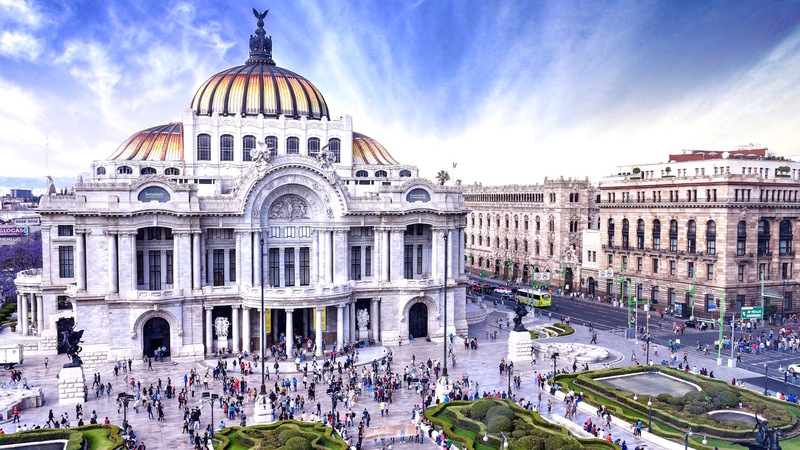 Just back from Mexico City, Michael Webb says the city can be exhausting, given its vast extent and horrendous traffic, but it’s also inexhaustible – guaranteed to surprise and delight the traveler who loves urban vitality. 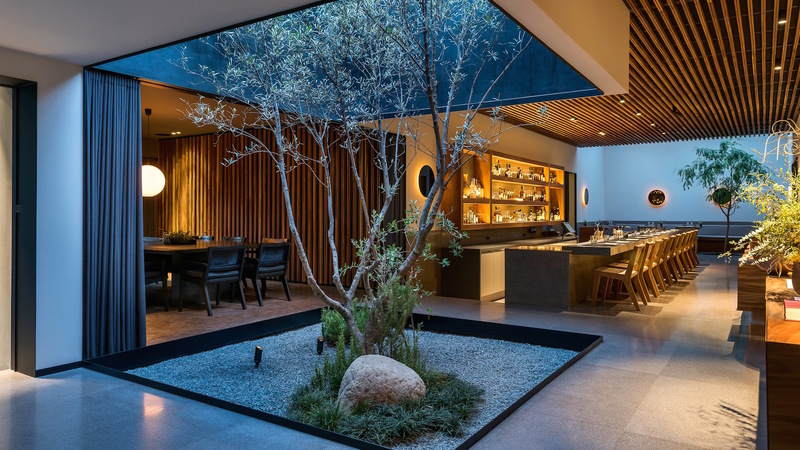 I recently returned to explore the Mexico City’s latest offerings and a few classics. 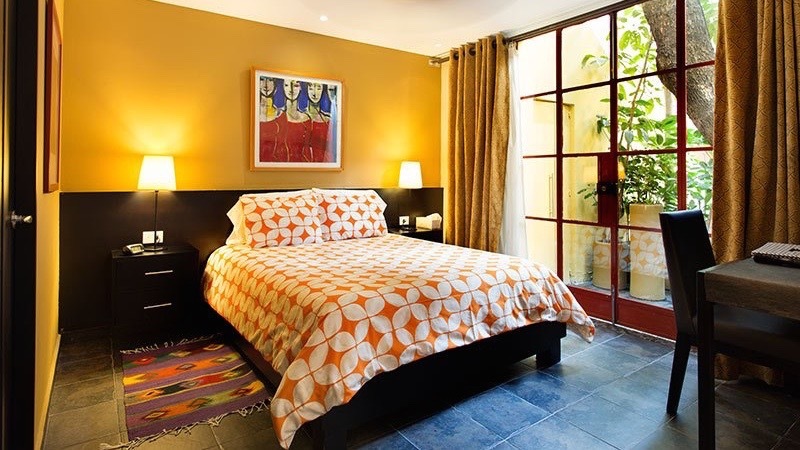 Last time I visited in 2010, I stayed in international hotels; this time I picked the Red Tree House, a B&B of extraordinary charm in the Condesa neighborhood. That’s my favorite part of the city for its leafy streets and Art Deco buildings, and it’s a safe place to walk at night. Of the new buildings, a standout is the Cuatro Caminos Foto Museo, a brilliant adaptation of an old factory. Within the white walls is a black steel and glass structure, stacked and layered to create wonderful plays of shadow and reflection. It’s simple, frugal and hugely effective as a showcase of contemporary photography. 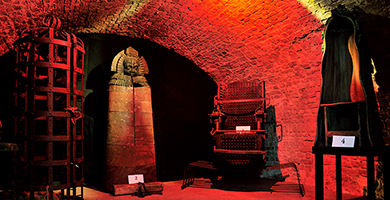 The Chopo Museum is an even more impressive example of adaptive reuse; a century-old cast iron market hall with insertions of wood, steel and acrylic beneath a Gothic vault that evokes a cathedral. 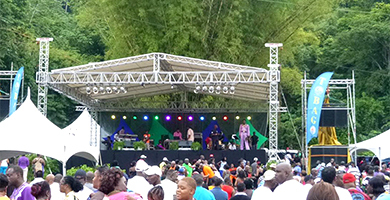 It presents changing art exhibitions. The National (Vasconcellos) Library is another dazzling architectural achievement, and a invaluable resource for the local population. 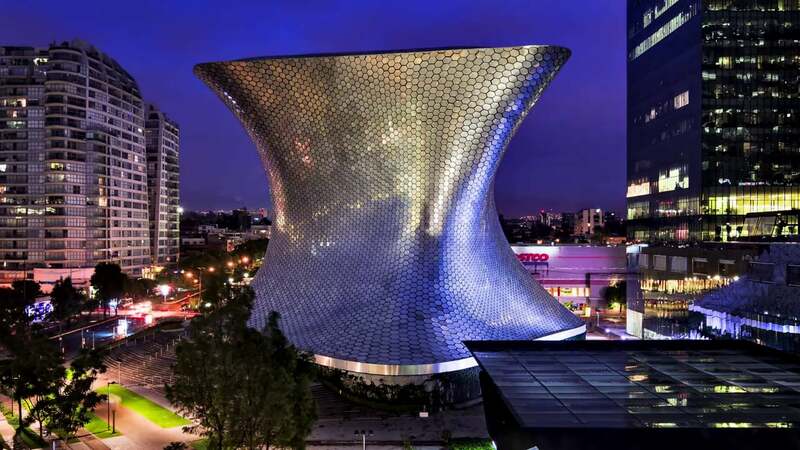 The showiest of the new buildings is the Soumaya Museum in Polanco, which resembles a cooling tower clad in metal scales. Entirely funded by Carlos Sim, the world’s richest man, it’s a vanity project jammed up against a shopping center with glaring signs and a glass office tower. As an art museum it’s a resounding flop. The interior with its vortex of space chopped into seven levels makes no sense volumetrically, for the scattered artworks on the first level are dwarfed and the canted walls cannot be used. At the top, a massive assembly of structural trusses obscures the skylight and overpowers a jam-packed collection of Rodin sculptures–more storehouse than display. A clumsily mounted Rembrandt is flanked by a fire extinguisher. 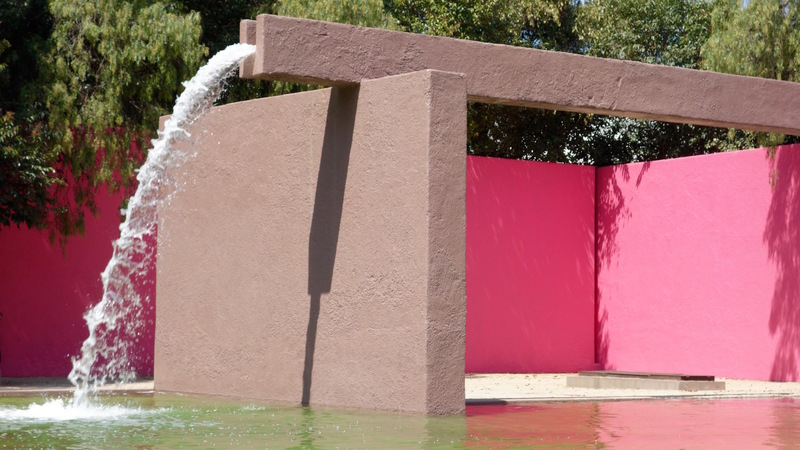 I fled from this folly to explore the work of Luis Barragán, Mexico’s greatest modern architect. Several of his buildings, including his own house, can be visited by appointment. Driving north on the Periferico–a heavily trafficked ring road–you spy a cluster of five triangular concrete obelisks, painted in primary colors and set at a high point on the median. In the early 1960s, Barragán collaborated with sculptor Mathias Goeritz on this public art work—a symbolic marker for Satellite City, which was to be built on farmland beyond the city limits. A few miles on is the Cuadra San Cristobal, a country estate in the gated community of Los Clubes. Commissioned by a Swedish family who loved horses it is celebrated for its immense yard enclosed by pink stucco walls and a row of stables. A water spout gushes into a shallow pool, and a similar fountain serves the neighbors. 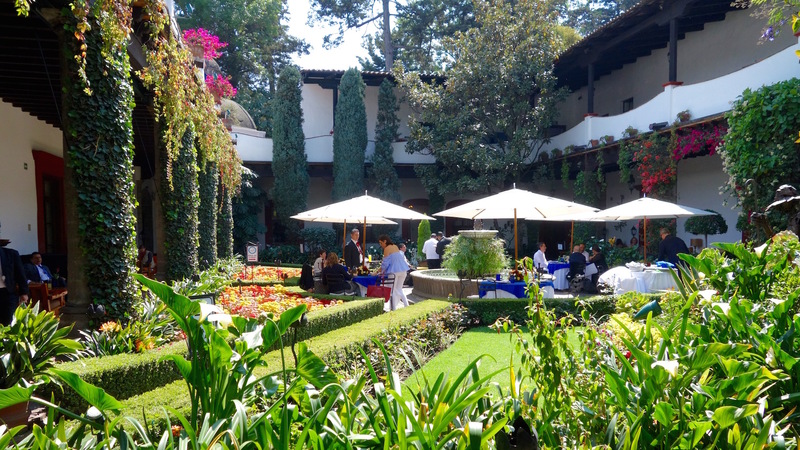 At the edge of Chapultepec Park is the Gilardi House, where you can wander though a succession of rooms and patios that immerse you in fields of color. A gallery with yellow-lined openings leads to an indoor pool with blue walls and an intense red column. Floors of richly grained stone open onto a courtyard, which was built around a jacaranda tree, with a blue wall merging into the sky. At every turn, shutters open to reveal another color field and the rough stucco walls add texture. 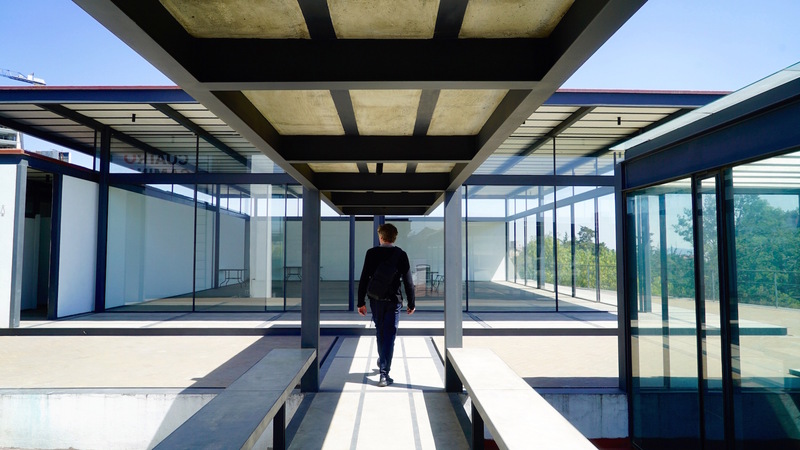 Barragán’s chapel for the Capucinas convent in the colonial settlement of Tlatlan is all about silence and emptiness. Light filters into a lofty white cube through a wood grill set high on the back wall. A wedge separates the nave from a side chapel in which irregular panes of yellow glass light salmon pink walls and a standing cross. A gold-leafed triptyque of panels behind the altar catch the late evening light. Another grille separates a side chapel to the right, and a yellow grid encloses a passage and is reflected by a basin of water in the courtyard. It’s a magical place, serene and mysterious; an abstraction of space, light and color.